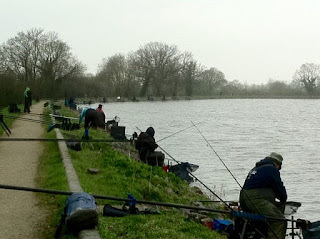 Back to Boddingtons Reservoir after the success of last year’s match here. The weather had taken a turn for the better on the Saturday with lovely sunshine, could spring actually be springing? Well, we all arrived to grey skies a high water level and quite windy conditions. This year’s match was already looking decidedly different to the sunshine, sunscreen and sunburn of 2017. Brian was our match organiser today as Hathers hadn’t confirmed his calendar with number 1 wife and couldn’t risk the long journey time. Good job you did mate as the car journey home was a nightmare! Out of the hat came peg 44. Last year I was on peg 43! Again it’s the higher numbers you really want however I had a good group of neighbours with Herbie, Shedders and a little bit further away Rick, Les and Jaapster.